The Longest Song To Make It Into The Top 10 Billboard Hits Is? A Demonym Is A Word That Identifies A Person By? While a wide variety of music has climbed the Billboard charts over the years, there’s usually one defining characteristic that unites pop songs, rock songs, and songs of all stripes: Billboard topping songs are usually short and radio friendly. Every now and then, however rarely, a song comes along that breaks the mold and captures the attention of the public with long arrangements and b-side spanning play. One of the earliest long songs to break into the Billboard Hot 100 Top 10 list (eventually topping the charts in early 1972) was Don McLean’s enigmatic 1971 hit “American Pie”. To this date, it still holds the record for the longest song, 8 minutes 33 seconds, to hold the number one slot. The longest song to break into the Billboard Hot 100 Top 10, however, outpaces “American Pie” by almost a half minute. That distinction belongs to the 1992 smash hit power ballad “November Rain” by Guns N’ Roses. The song features a sweeping and lengthy orchestral backing, guitar solos, and all the trappings you’d expect of an epic power ballad from one of the most popular rock bands of the late 20th century. Impressively, the song lyrics, the band arrangements, and the orchestral arrangements were all composed by lead singer Axl Rose. Rose worked on the song on and off again for around a decade before it was released—the final cut weighs in at 8 minutes and 57 seconds. It would be remiss of us to not discuss the accompanying music video. Not only was “November Rain” the longest song to ever break into the Billboard Hot 100 Top 10, but at the time of its release, the music video, with a budget of 1.5 million dollars, was the most expensive music video ever created. The video included footage of an orchestra playing, naturally, the orchestral portions of the ballad as well as the then-girlfriend of Axl Rose, model and actress Stephanie Seymour, as the bride in the epic story along with footage of the story unfolding in various settings, including multiple churches. 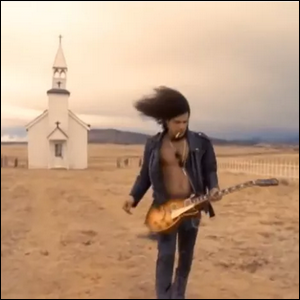 And if all that trivia isn’t enough to satisfy you, here’s an extra deep cut from the trivia archives: the remote church seen here (with guitarist Slash playing in the foreground), was in the New Mexico desert and, coincidentally (or not, given how scenic it is) makes an appearance in the 1985 cowboy film Silverado. Image courtesy of Guns ‘N Roses/VEVO.